YaraVera AMIDAS Urea is hard, homogeneous and provides even distribution. 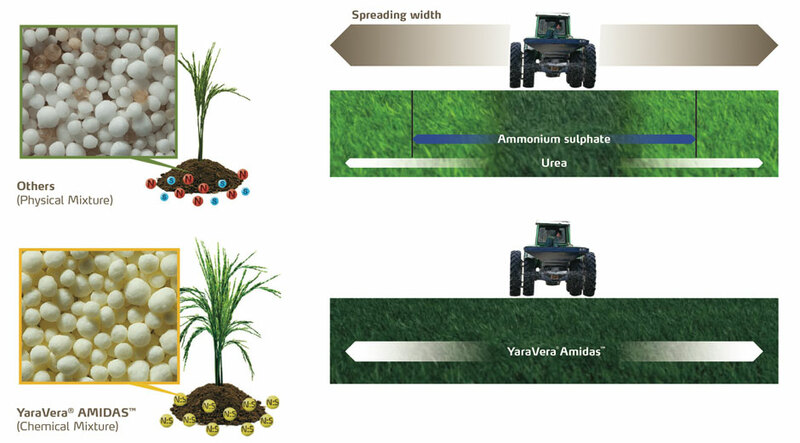 YaraVera Amidas is a unique granular, homogeneous fertilizer that is highly soluble and very efficient. It contains nitrogen and sulphate sulphur that is readily available to the crops in an ideal N:S ratio of 7.3:1. This ratio is optimal for amino acid and protein synthesis. Also, the presence of ammonium sulphate in the same granule as urea aids in optimal plant uptake of both N and S.
N and S are essential for plant structural and functional protein development. N is the most commonly deficient nutrient and sulphur is deficient in many cropping systems limiting plant growth and yield. Plant roots need to maintain electrical neutrality as they take up nutrients. The positive cations are equal to the negative anions, and so the uptake of N as ammonium (NH4+) enhances uptake of S as sulphate (SO4=). Applying the N and S together in the Amidas homogeneous product helps assure top yields by supplying N and S in the forms the plant needs. Plants utilize nitrogen and sulphur together to build proteins and DNA. The typical plant N:S ratio is from 8:1 to 13:1, so the YaraVera Amidas N:S ratio of 7.3:1 is optimal for protein synthesis. AMIDAS is a fertilizer which contains nitrogen and sulphate sulphur that is totally available to crops. It has an ideal N:S ratio of 7.3:1 and is a high-nitrogen alternative to ammonium sulphate. Each granule of YaraVera Amidas is a homogeneous, chemical mixture of N and S in the form of urea and ammonium sulphate. It cannot segregate. Fertilizer blends can segregate during handling and storage in the bag, pile, in the spreader hopper and during spreading. Once segregated, an uneven application of nutrients results. Another consideration is that the spreading width of small, light particles is less than that of larger, heavier particles in a blended mixture. The result is uneven nutrient application causing striped fields and reduced yields. Also, nitrogen and sulphur in the same granule enhances root uptake compared to blends, resulting in balanced nutrition for optimal plant growth.